Solitude Guards are guards who act as the military and police force of Solitude. These guards serve under Jarl Elisif. Should the Stormcloak forces gain control of Solitude, they will be replaced by Stormcloak guards. They are often local recruits for the Imperial Legion, undergoing training led by Captain Aldis. 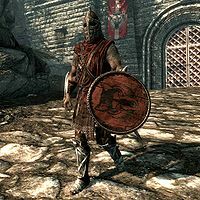 Guards patrolling the rest of the hold (outside Solitude) are called Haafingar guards, and they carry the same equipment as Solitude guards. This page was last modified on 26 November 2016, at 03:59.